Usually, when you sing karaoke in Japan, you either sing it in a bar, or at a room at a karaoke parlor, or maybe somebody's house. But those ways involve other people. And what if you don't like other people? There's this. Dubbed "Choi Kara," these telephone box-like, sound-muffling booths allow folks to belt out karaoke tunes. These have been around since 2013, but recently have become a hot topic on Twitter, after the above photo was retweeted over 2,700 times. "Choi Kara" is short for "A Little Karaoke" and inside, there are mics, a screen, and a bench. The official Taito website for Choi Kara says that this booth is perfect for those who want to sing certain songs, but don't really want to do so in front of others. 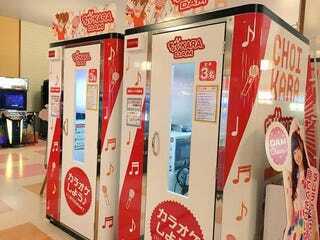 It also can be used for those who want to practice their singing in private (karaoke is a big deal in Japan! you wanna be good! ), or those who just want to sing with total and utter abandonment. The site also points out that with Choi Kara you don't have to deal with staff like you would at an actual karaoke parlor—even ones that cater to solo singers. So good news shy people and misanthropes, this is people-free! Pricing really depends on the arcade. Most are charging 100 yen (under a dollar) for one song, which is pretty good if you plan on only singing a song or two. I've also seen at least one arcade charging 200 yen for three songs or even twenty minutes of singing for just 200 yen. Should you have at least two friends, the three of you can fit into Choi Kara, which has a clearly stated maximum occupancy of three. If you go in by yourself, nobody will judge you. I know I won't. Go on. Step inside. Take the ride.